A post that is about neither books nor movies, nor about any lectures, public performances, or teaching-related activities in which I may be involved. We have a new look to our sufilmvideo.org website. Check it out! And while you’re there, note our first big event of the year, which is a visit from local cinematographer Errol Webber. Sep. 12-14, 2012: Cinematographer Errol Webber will be the Fall 2012 Film/Video Artist-in-Residence. See the flier, above. 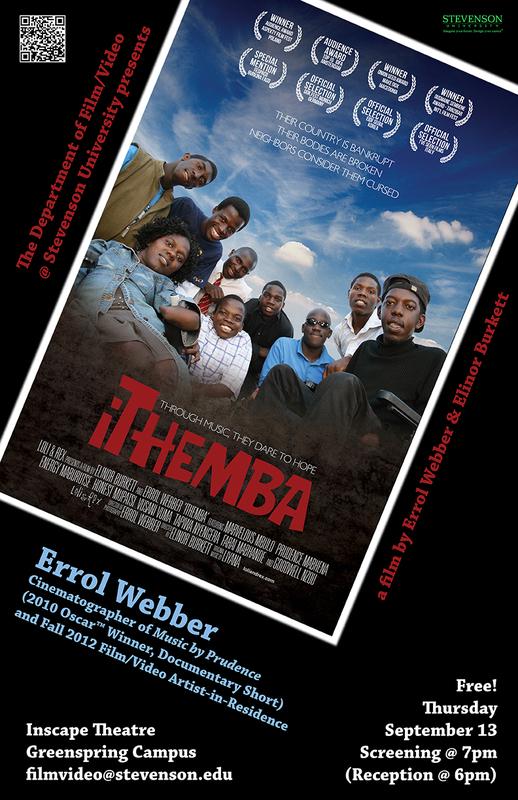 For a trailer of Ithemba, the film that we will screen on Thursday, Sep. 13, click here. For directions to the campus, click here. Just recently, I spent a little over a week blogging about my experience watching 14 movies in 7 days. I used my Stevenson University blog to post my reviews, and while there is nothing wrong with that, I thought, at the of the process, that it would make sense to separate my Stevenson life from my outside life. Plus, that other blog should, ideally, be devoted to the work of my students, and not to me or my work. Enter chrisreedfilm.com. I was lucky enough that this domain name was open. When I created my Twitter account, I had chosen @chrisreedfilm as my handle, and had then subsequently chosen “chrisreedfilm” as my Vimeo account name, as well. I already own the domain name christopherllewellynreed.com, which you’ll notice I have now pointed to that same Vimeo account, but chrisreedfilm.com is much simpler (even if there are many other people with the name “Chris Reed” out there, but only one “Christopher Llewellyn Reed”). And thanks to Google Apps, I now also own the email address chris@chrisreedfilm.com. So here I am, on my new blog. I think it would be most appropriate to provide a decent segue from the last few weeks of movie reviews, so here is a pdf of the text and links from those posts. I was only on for 10 minutes that day, because we didn’t do the scheduled show – the massacre in Colorado that morning was of more pressing concern than summer movies. Thanks to all who take the time read this and other posts in the future. I am grateful.